Hold up! You don't have flowers? Corsages are "cheesy"?! 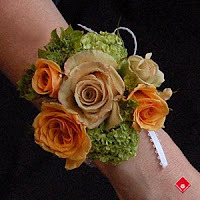 Girl, flowers are essential - and I will help you pick the perfect corsage to go with your dress. Just pick out your look below and let us do the rest. Your dress: Betsey Johnson, pink, ruffles, bows, tulle, sparkles, pretty!